That’s true; an image is worth a thousand words, but an image with caption makes it more meaningful. An image caption is a few lines of information (usually a plain text under an image) that describes an image or a portrait. In most of the photography blogs you can see image captions and they use it to express their photos, not sure how to caption images. Both wordpress and Blogger makes it simple, here comes the beginner level tutorial on how to add caption to images or videos in wordpress and Blogger. Adding captions to images in wordpress is very simple and there is no need of any plugin because the feature is built in. Usually you will add images in to your wordpress post or page by clicking on add media button. This option will open a screen to insert media files where you will insert images from URL or by uploading files or by choosing from media library. Whatever it is, before inserting image in to your post or page you will see attachment details and in there you can see several fields to add image titles, image caption, alt text and description. OR after inserting your image, click the image, choose to edit and you will have the options to add title, alt text and captions. Add image title, alt tags if you want and in caption field describe your image in few words. The image title will be visible when a mouse hovers over the image, alt text is used for the purpose of SEO and a caption lies below your image just like this. So the above method is used to caption single image on just single post or page, but what if you wish to add captions to various images on various posts. For example you have a common image that you use it on several of your post, so to add caption you don’t have to edit each and every post. Just adding a caption to single image will applies to all your posts and other than that you can also add image captions straight from your medial library. Just go to your media library, select the image and under the image you will have the option to add caption. Hope that helps in adding image captions in wordpress, now let’s see how to add caption to videos in wordpress. For example let’s say you are embedding a YouTube video in your website and would like to add a little caption or a message beneath that video, how would you do that. In wordpress there is no such option to caption videos, but by using a shortcode you can bring that. Normally you will embed a video using shortcode just like this. Now to add caption under your video you have to enclose the embedded video using shortcode just like this. Just embed your YouTube video, choose width and add caption that’s it, so the final output will be something like this. For Blogger we have previously covered abut adding title and alt tags to images, but not captions. 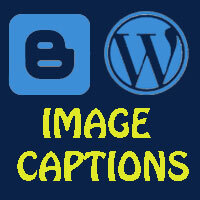 Adding caption to your Blogger images is same like wordpress and it’s simple too. Just login to your Blogger blog, open your blog dashboard, choose posts or pages and then add an image as you would normally do. After uploading the image, click on the image and you will see several options that show up in a blue stripe under your image. Click on add caption to add caption and click on remove caption to remove caption. All done! Hope this post helped you on how to add captions to images or videos in wordpress and Blogger. If you like this post and wish to get more updates from us then follow us on Twitter.